DETROIT - Police say a Michigan state senator is suspected of firing shots at his girlfriend's car over the weekend. Police Chief James Craig said Monday Virgil Smith is in custody. He told reporters that a gun was seized from Smith's home. Craig says the Detroit Democrat has been cooperating with investigators. No one was injured in the shooting, which occurred early Sunday outside Smith's home. CBS Detroit reports the shooting took place during an argument between Smith and his ex-wife -- who is again his girlfriend. According to the station, police say at least two shots were fired at the woman's Mercedes-Benz. A message seeking comment was left at the senator's office. Smith has been in the Legislature since 2003, first serving in the House. 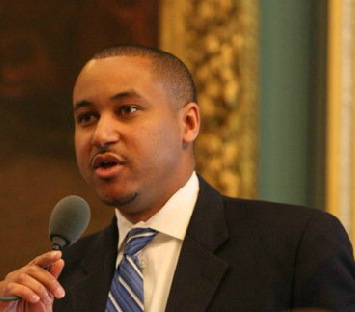 He's the son of Virgil Smith Jr., a Wayne County judge and former state lawmaker.